This set of wavelengths are sensitive to ozone absorption, water vapour absorption, aerosol scattering, and Rayleigh scattering, as indiated above. 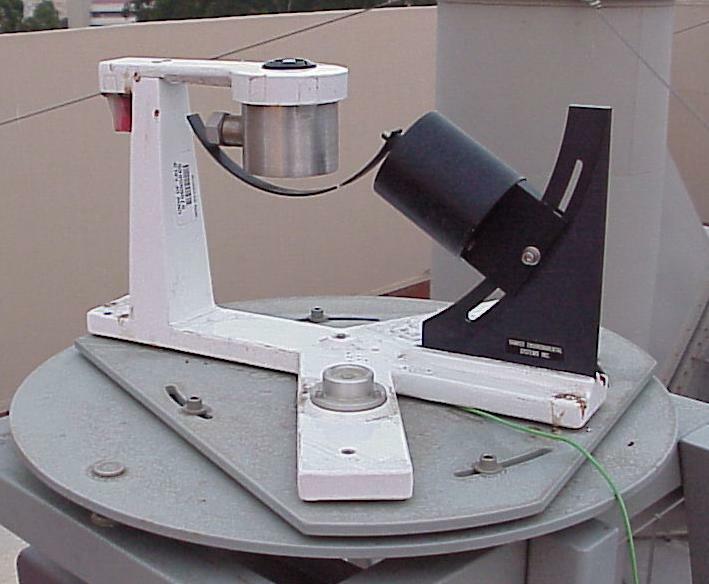 An initial measurement of both the diffuse (or scattered) and the direct solar beam is made. 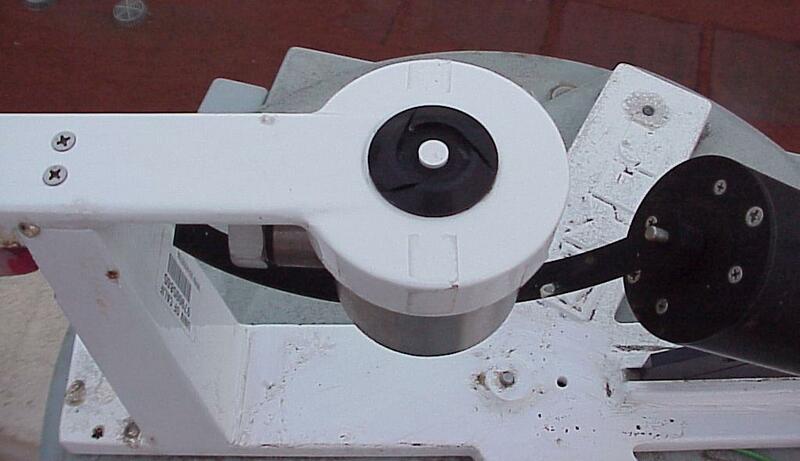 The shadowband is then rotated to block out the direct solar beam so that a diffuse measurement can be made. A measurment of the direct solar beam is obtained by subtracting these two. such that a=ln(Io) represents the y-intercept and b=OD represents the slope. Thus, if the AMF is plotted versus the logrithm of the irradiance (at a given wavelength) for many data points throughout a morning or afternoon, a straight line should result. Linear regression performed on this data will give the slope and intercept, which amount to the logrithm of the extra-terrestrial irradiance and the vertical optical depth. The vertical optical depth of the atmopshere includes components from molecular and aerosol scattering and, depending on the channel, may also include absorption by ozone or water vapour. where SZA is in radians (Kasten and Young, 1989). where Po=1013.24 mbar is standard surface pressure and wavelength is in nm (Hansen and Travis, 1974). 1. Bigelow, D. S., J. R. Slusser, A. F. Beaubien, and J. H. Gibson, The USDA ultraviolet radiation monitoring program, Bulletin of the American Meterological Society, 79, 601-615, 1998. 2. 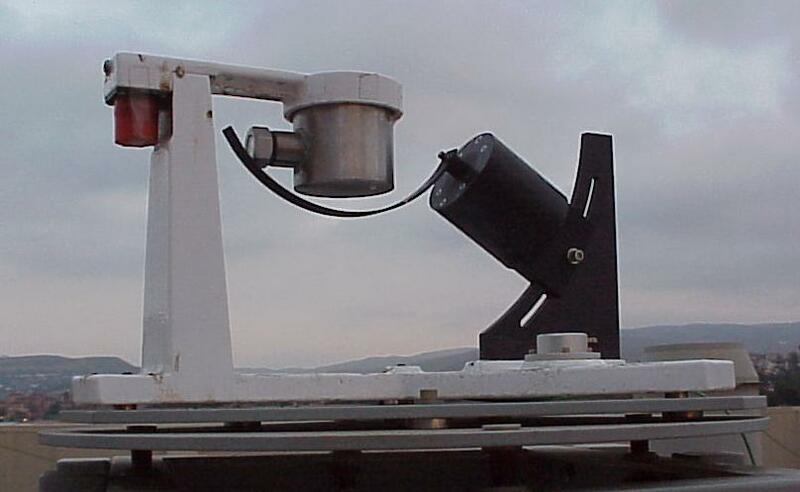 Harrison, L., J. Michalsky, and J. Berndt, Automated multifilter rotating shadow-band radiometer: an instrument for optical depth and radiation measurements, Applied Optics, 33, 5118-5125, 1994. 3. Harrison, L. and J. Michalsky, Objective algorithms for the retrieval of optical depths from ground-based measurements, Applied Optics, 33, 5126-5132, 1994. 4. Hansen J. E. and L. D. Travis, Light scattering in planetary atmospheres, Space Science Reviews, 16, 527-610, 1974. 5. Kasten and Young, Revised optical air mass tables and approximation formula, Applied Optics, 28, 4735-4738, 1989. 6. Alexandrov, M. D., A. A. Lacis, B. E. Carlson, and B. Cairns, Remote sensing of atmospheric aerosols, nitrogen dioxide, and ozone by means of multi-filter rotating shadow-band radiometer, in Remote Sensing of Clouds and Atmosphere, J. Russell and C. Serio, Editors, Proc. SPIE 3867, 156-170, 1999. This page was last updated 19-May-2000.